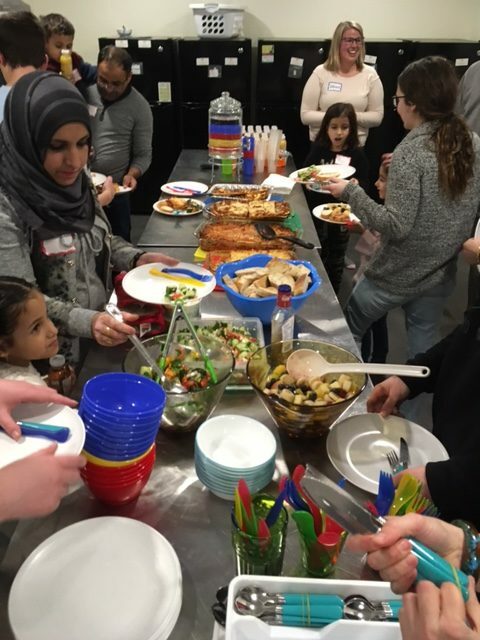 Community meals at Reception House are an opportunity for community members from all walks of life to welcome refugee families who are new to our region. Community meal hosts are invited to share a home cooked (or store bought) meal with refugees who have just arrived to Canada. Community dinners take place at our temporary accommodation site on David St. across from Victoria Park where families live during their first 2-4 weeks upon arrival to Canada. Meal hosts are invited to bring games, activities, songs or just the meal. Staff help facilitate conversation across language barriers. We welcome potential meal hosts to register with our volunteer services coordinator at volunteer@receptionhouse.ca. Community meals are held once a month. Considering a volunteer position at Reception House, but want some exposure to the families that we serve before you make a longer term commitment? This is a great place to start. Let us know what programs you are interested in, and our staff will come prepared to share information and answer questions. When and where do Community meals take place? Community Meals take place once a month typically on Thursdays at 101 David St. Volunteers can prepare a lunch or dinner. Arrival is a half an hour before serving. Lunch is at 12 p.m. and dinner at 6 p.m. Other arrangements can be made by request. Can my workplace or a corporate group prepare a meal? Yes, you are more than welcome to bring a group of coworkers or friends. Due to space limitations, we ask that the meal host group be no larger than 6 people. What types of dietary restrictions should I consider? We recommend always buying halal meat and avoiding pork. You can also choose to prepare a vegetarian meal. Kishki World Foods on Highland Road and Ammar Halal Meats on Lancaster St West specialize in hala meat, however, you can also find Halal food in your local grocery store – just look for it on the packaging. We also recommend keeping all sauces, gravys and strong seasonings on the side so that guests can decide whether or not they want to add them. Plain dishes with optional add-ons are the best bet for the diversity of pallets. Having an ingredients list can be helpful to avoid allergies, or confusion around dietary restrictions. Can I prepare the meal at Reception House? No. It is preferable to come with a prepared meal. If additional prep is needed, you will have access to two ovens, a refrigerator and a freezer and basic kitchen supplies, but they may not meet your specific meal needs. Can my family prepare a meal? Yes. We welcome families – particularly those interested in becoming Family Partnership Program volunteers at Reception House. Our space is kid friendly and we have highchairs available for babies. Can I volunteer to cook meals every month? When should I call Reception House to confirm how many people will be at the meal? The Monday prior to the dinner OR 4 days in advance of the dinner. Reception House receives newcomers on a rotating basis. At any given time there may be between 2 and 35 people living in the house. Not Another Gala – 2019!